Reptiles don’t have protruding ears like mammals do, and at first glance, it looks as though bearded dragons have no ears. This is because there is no external structure designed to collect sound. A bearded dragon’s ears simply look like holes. Although there are no external lobes or other appendages, they have excellent hearing. 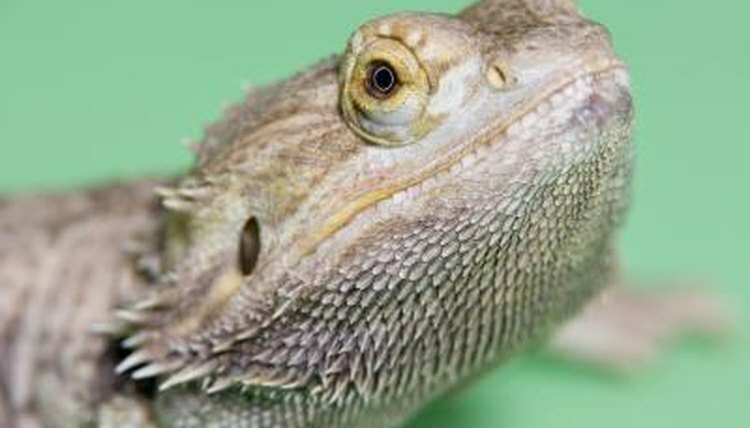 The bearded dragon’s ears appear as holes in the head located farther back than the eye, and about halfway down between the eye and the corner of the mouth. If you look into them, you can see a thin membrane recessed across the opening. This is the tympanic membrane. In some other lizard species, such as the iguana, this membrane is closer to the surface of the head, making it more susceptible to damage. Internally, the bearded dragon ear is similar to our own. Both rely on a series of small bones and membranes to transmit sound to a liquid-filled cavity in the form of changes in pressure and airborne vibrations. Vibrations in the liquid stimulate clusters of sensory cells, which transmit electrical impulses along auditory nerves to the brain to interpret the sound. Bearded dragons have a middle ear and inner ear, just like mammals. The tympanic membrane covers the middle ear and vibrates in response to sound waves. There is a small bone called the stapes, or stirrup, which sits in the middle ear and runs between the tympanic membrane and the inner ear. The tympanic membrane transmits the vibrations to the stirrup bone and through to the inner ear. The inner ear contains the cochlear duct which is filled with fluid. Small hair-like cilia pick up the vibrations and transmit the information through the auditory nerve to the brain. The inner ear also contains organs that regulate balance, including the semicircular canals, which operate in the same way they do in people. Although very different in appearance, the ear of a bearded dragon operates in basically the same way as a human ear.